When the people of Orwell first adopted Christianity, sometime in the second half of the First Millennium, they probably built a small church of very simple wood, clunch or clay bat construction on or near the site of St Andrew’s. The foundations of this building may lie under the present church, but its only visible relic is a piece of stone carved with a Saxon interlace pattern and now set into the wall of the church porch. A Saxon gravestone has also been preserved in the porch. A larger and more permanent church was built sometime in the 12th Century, with an aisle-less nave and a chancel, and thatched roofs. 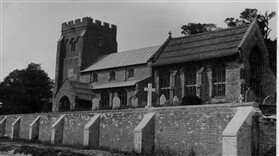 The external corners of this Norman nave, with their rounded stone angle shafts topped by “cushion” capitals, can be seen on the outside of the church in the angles between the tower and the north and south aisles. The tower was built of clunch, probably from the local pit, in about 1250 AD and is in the Early English style. Soon afterwards north and south aisles were added to the nave and the present arcades, with their massive clunch columns, were inserted between the nave and the aisles. 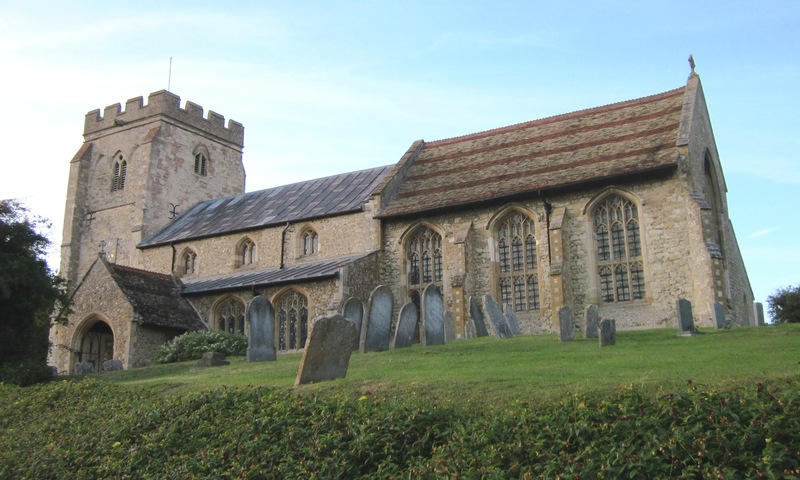 The existing chancel and vestry were built around 1400 AD with money left by Richard Anlaby, Rector from 1388 - 1397. The chancel is a fine building, furnished originally with stained glass which was smashed during the Commonwealth by the Puritan William Dowsing, acting on Parliament’s orders to purge churches of all traces of ‘Popery.’ A few small pieces of the old glass survive in the early 18th Century windows of the chancel, where the name of Dr Colbatch, Rector from 1720 - 47, is engraved, with the date 1721. The glass in the great east window was a gift from the estate of Revd. 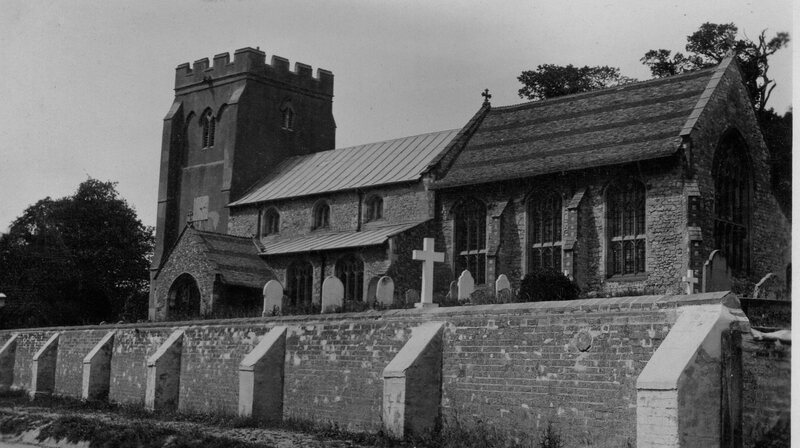 Whiston, Rector at the turn of this century. It was designed by the late Leonard Evetts in 1957 and depicts scenes from the life of St. Andrew. There has been some confusion in the past about the correct dedication of our church. Some 19th Century documents refer to it as St Peter’s, but an Ely Diocesan official, Sam Knight, when writing to Orwell’s Rector in 1721, stated quite firmly that “your church is dedicated to St Andrew” and St Andrew’s it is and ever shall be. The chancel roof is divided into sixty-six panels with carved bosses and painted shields at the intersections. Some of the shields carry the coats of arms of renowned Cambridgeshire families, while others represent the University and Trinity College, patron of Orwell church until 1935. In the chancel are two ranges of eight choir stalls, made around 1550, some of which still have their original carved misericord seats. They may be the work of a local craftsman. The church also has some interesting monuments, including a bust of Jeremiah Radcliffe, Vice-Master of Trinity College, Rector of Orwell 1590 - 1611 and one of the translators of King James’ Bible. High above the north arcade of the nave may be seen a blocked doorway which would have led to a rood-loft on the west side of the chancel arch, but both rood screen and loft had been removed by the late 19th Century, bringing to light a clunch reredos, carved with the figures of Christ and St John, which is now displayed in a recess in the south aisle. The font is a simple Norman bowl on a later pedestal. The turret clock, probably made by Leonard Tennant about 1610, belonged to Trinity College until 1726 when it was presented to Dr Colbatch for this church. It is one of about fifteen surviving clocks of the same type, believed to have been made by Tennant and his associates. There are now eight bells in the tower, the oldest probably cast in 1615 at Stamford by Toby Norris, and the two newest cast in 1998 with a grant from the Millennium Commission, ready to ring in the 21st Century. This gallery was added by Martin Grigor on 05/11/2012.